not too bad arvo at Peelie.Started out slow and patchy but got better at the end. Half a dozen guys ou and more arrived later. Dont know what they ended up with. 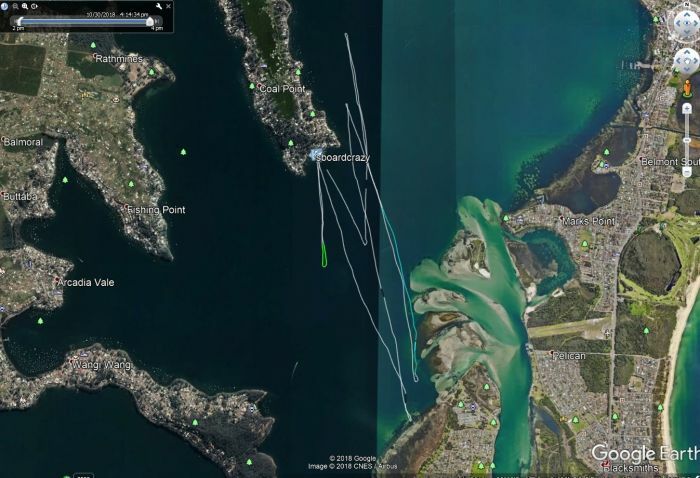 10-12kts out the front but 15-18kts + at Sand islands and above the point although it was patchy above the point. I think it was best when I first arrived. One run on the smaller board and great in the gusts but not powered up consistently enough to work up higher where the wind was. Changed to the bigger board with a weedy. Fair bit of floating weed but it didn't seem to be affecting things much . Probably should have stayed with a pointer.. In the lulls I wanted the 7.5m ( even then some would have been marginal) and in the stronger stuff the 90ltre would have been great.. More wind at the sand islands but choppy wind against tide..1st time I've felt the colder water from the channel ( across bootie) .Went for a nm but working hard to keep on the plane . I should have chugged across to the sand islands with the 90ltre and had fun.. Tried the M1 Od because I like it's stablity but I think I'll go back to the twitchier NCX as the M1 is much heavier with the luff tube full and starting in the sheltered area with cams popped the wrong way was a pain.. I strained my right forearm last sail so went to Coal for longer runs and less gybes than Budgy. It went ok but I noticed I stuffed my port tack gybes..probably being too careful with my arm and not sheeting in as I gybed. Quit early due to arm and I wasn't really enjpying it that much. It seemed to fill in between Coal and the islands for a while then back to patchy. Just Tony & I at first . Lyds called down from the slips for a visit.Then Hugh , Lajos, Will, Gert, Craig and Andrew. Fanatic 114, 7 Simmer SCR, 41 select fin. Wind a bit flukey, had a couple of good runs over at sand islands. Good sailing with the coal point gang. You were flying Hugh! Looked like you had a good exploration of the lake too..